Using new methods to analyze stone projectile points crafted by North America’s earliest human inhabitants, Smithsonian scientists have found that these tools show evidence of a shift toward more experimentation in their production beginning about 12,500 years ago, following hundreds of years of consistent stone-tool production created using uniform techniques. The findings provide clues into changes in social interactions during a time when people are thought to have been spreading into new parts of North America and adapting to different environments, beginning a period of cultural diversification. 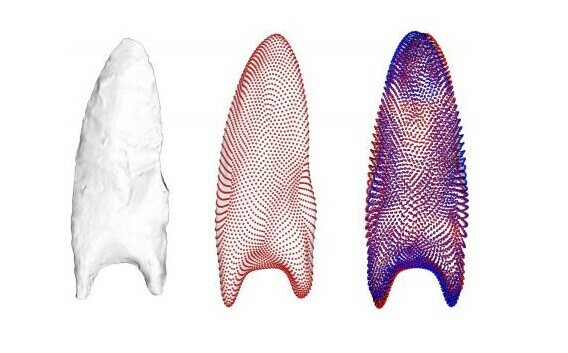 The research team, led by Sabrina Sholts, a curator in the Department of Anthropology at the Smithsonian’s National Museum of Natural History, and Sebastian Wärmländer at Stockholm University, used digital 3-D models to scrutinize the angles and contours on the surfaces of North American projectile points. In doing so, they discovered a turning point at which the techniques used to produce the points became more variable. That variability suggests that individual toolmakers, who may have had fewer opportunities than their predecessors to learn from others, began working out how to make the tools on their own. The findings were reported July 12 in the journal PLOS ONE. The earliest well-documented group of people in North America, known as Clovis, is recognized by distinctive pointed stone projectiles that appear about 13,500 years ago. These culture-defining tools, called Clovis points, are sharp-edged and symmetrical, with a groove near the base–called a flute–where a spear shaft may have fit. Anthropologists consider them to be a very sophisticated technology. Scientists analyzed three-dimensional models of Clovis projectile points from Smithsonian and other museum collections to examine how patterns and marks made in crafting these tools began to vary regionally 12,500 years ago. These regional differences signal cultural diversification and adaptation, suggesting that groups of early hunter-gatherer Americans may have changed the way they were social interacting at this time. This figure shows one analysis used to study shapes left behind from their production on either side of the projectile points. CREDIT : Sebastian Wärmländer, Stockholm University. The highly mobile hunter-gatherers of the Clovis culture spread quickly across North America, and Clovis points have been found all over the continent. In 2012, Sholts and colleagues analyzed 50 authentic and replicate Clovis points, examining how their surfaces had been shaped as flakes of stone were chipped away to craft the tool. Using an approach Sholts and Wärmländer originally developed for studying bones, the researchers laser scanned each point to create a three-dimensional model and then analyzed its contours, measuring and comparing subtle surface features that cannot be discerned by eye. “It’s a way to capture all the individual actions to reduce the core, which reflect the technique used to shape it,” Sholts said. The analysis revealed remarkable consistency among the ancient artifacts compared to almost perfect copies made by a modern knapper, an artisan that crafts stone tools using ancient techniques. The team concluded that the manufacturing technique used by the Clovis people was so uniform that it must have been passed on directly from one knapper to another. According to the archaeological record, Clovis technology was used for several hundred years. A variety of other styles emerged later, though they never spread across the continent like Clovis points did. To learn more about the groups that manufactured these later styles, the authors of the new study analyzed the surface features of 100 projectile points from collections at several museums, including the Smithsonian collection, which is curated by anthropologist Dennis Stanford. The new study included Clovis points and samples of four later styles of fluted points, which had been recovered from sites in the eastern United States. The team analyzed the points’ surface contours as they had done in the earlier study and also introduced a new method of analyzing digital models to assess the objects’ three-dimensional asymmetry. Using another new technique developed by Wärmländer and co-author Stefan Schlager of the University of Freiburg, the team determined that the overall three-dimensional shapes of the points did not vary significantly. However, they did find increased variability in the surface contours among some of the later styles of points, indicating that those tools had not been produced using a consistent technique. The increase in variability among the later points suggests a decrease in social learning and possibly a reduction in overall interactions among North American populations beginning around 12,500 years ago, the researchers say. This is consistent with anthropologists’ current thinking about how people were living during this time. “There seems to be evidence of increased experimentation during this period, due to groups moving away from each other and pushing into new environments,” Sholts said.